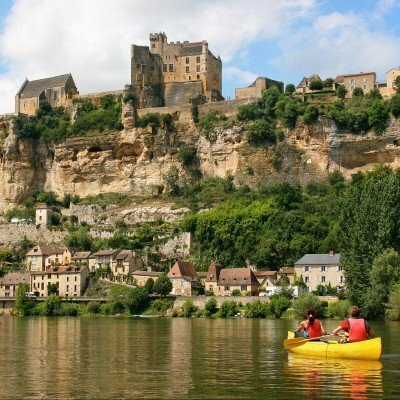 Exploring France's rivers on a canoeing holiday you really are in a different, secret world, with just the occasional fisherman to wave at cheerily as you glide by. There's no easier way to discover unspoilt France. Before you set off, our staff will show you how to handle your boat. The canoes are light (around 30kg) and stable enough to carry up to three adults (or two adults and one child). Our sit-on-top kayaks are lighter and easy to paddle and their open-top design means they are very safe to use - great fun for the over-12s. We use high-quality equipment and you will receive thorough canoeing lessons prior to beginning your holiday. Since we started canoeing holidays more than 20 years ago we have not had a single serious mishap – and this is something we’re proud of. You will be supplied with waterproof containers for stowing picnic items, a life jacket and a helmet. In the unlikely event that the river is unsuitable for canoeing, we will provide you with a bike, walking routes or offer other suggestions to ensure you continue to enjoy your holiday, until we can get you back on the water. Please note that all members of your party must be able to swim at least 50m clothed. Younger children can go on the centre seat of our canoes, whilst older ones usually want kayaks. In addition to our traditional canoe sit-in canoes, we have a choice of Venture canoes and Perception sit-on-top kayaks, plus Perception double sit-on-top kayaks. You may get splashed a little more paddling these than the canoes, but they are extremely safe to use, very easy to paddle and teenagers will love them.